Captain Marta Ramos, the most notorious pirate in the Duchy of Denver, has her hands full between fascinating murder mysteries, the delectable and devious Delilah Nimowitz, Colonel Geoffrey Douglas (the Duke of Denvers new head of security), a spot of airship engineering and her usual activities: piracy, banditry and burglary. Not to mention the horror of high society tea parties. In contrast, Simms, her second in command, longs only for a quiet life, filled with tasty sausages and fewer explosions. Or does he? Join Captain Ramos, Simms and their crew as they negotiate the perils of air, land and drawing room in a series of fast-paced adventures in a North America that never was. Take Sherlock Holmes. Make him a Latina railcar pirate in a steampunk Denver where the dead are at risk of rising again and you have Murder on the Titania. The work of Sir Arthur Conan Doyle and Agatha Christie is often peppered with bigoted stereotypes. Murder on the Titania subverts those elements in a way that’s delightful to read. This is probably most in evidence in the first (and titular) story of the collection. In this story, Colonel Geoffrey Douglas is charged with transporting some valuable jewellery from the Duchy of New York to home in the Duchy of Denver. A murder takes place while the airship is en route and the Colonel is called upon to investigate. It’s a bit of an oblique introduction to Captain Ramos, but one that works through contrast. Geoff is by no means stupid–his intelligence was one of the things I enjoyed about the character. However, his biased assumptions blind him to investigative possibilities. The racism of Holmes is absent–indeed, PoC are present and an unremarked upon part of the world–but the characters share some similar biases regarding women and class. Captain Ramos is more open-minded. On the surface, she doesn’t have much in common with the famous detective. However, she does share a few of his other traits, such as a horror of boredom and an apparent disregard for personal safety. Much like Holmes, she remains a fairly enigmatic character; while we do get some scenes from her perspective, the third-person viewpoint keeps some distance. More of the story is told from the perspective of her Watson, a red-headed man from the working classes by the name of Simms. He plays the long-suffering sidekick who claims a desire for a quiet life, but not-so-secretly enjoys the thrill of an adventure. The structure of the book works well. The first two novellas and the short story are each self-contained episodes about a discrete mystery. The third novella brings back a couple of characters and advances the worldbuilding in a way I found particularly satisfying. It’s in this story that we get to see Ramos with her crew, an experience made all the more delightful by seeing them do what they do best–robbing trains. It would have been nice to see more of the team and I have hopes for future books. The last novella brings us full circle back to the airship Titania, making it a nice way to round out the collection. I’m not much of a mystery reader, more for lack of time than lack of desire. So, I might not be the best judge in relation to the mystery elements of the story. However, I found some aspects a bit predictable. This didn’t in any way detract from my enjoyment of the book, especially since it took place in such an interesting setting. 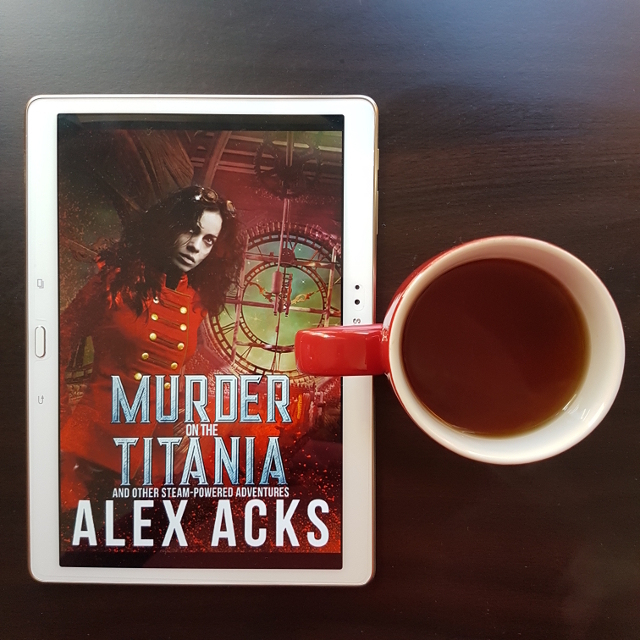 All in all, I found Murder on the Titania to be a fun read that does a wonderful job of paying homage to Sherlock Holmes while simultaneously subverting its problematic elements. I very much hope to see more in the future.